First contact may be our last. Beyond our world lies the unknown, countless planets with endless possibilities. On a dark world far from our home, an epic war started a chain reaction, sending two alien races on a collision course with Earth. Secret battles wage on our soil, brewing a cataclysmic war that could change the face of humanity forever. If we can't prevent an alien armageddon, we'll find ourselves fighting forces with technology thousands of years more advanced than ours. The war is on, and time is running out. 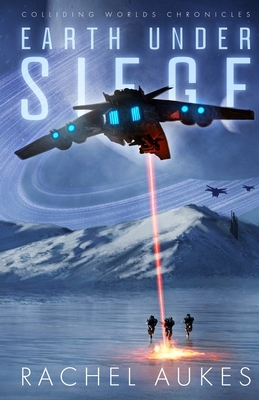 . .
Sienna Wolfe's life changes when a strange craft crashes near her cabin, and she finds herself in the middle of a bitter battle between two warring alien races, the likes of which could wipe out mankind. As she races to align her new allies with the U.S. military, she may soon learn that her new friends may not be as noble as they seem. Can Sienna prevent an interstellar war from claiming Earth, or will she become the harbinger of an alien apocalypse? As Sephian forces peck at the Draeken defenses, we soon learn that things are never as simple as right and wrong. Draeken Commander Roden Zyll has spilled plenty of blood in his time, and he cares little for humans. But when he realizes his leader's plan could lead to his people's extinction, he plans a coup. Only one problem: he has to work with the Sephians to succeed. If he fails, every Earth nation will be yanked into a war that no one has a chance of winning. When a deadly virus is released across the planet, all aliens are quickly blamed. When a mass execution is planned, Captain Jax Jerrick becomes a traitor to the military in order to save the Sephians and the Draeken. After bloody battle, he escapes and joins the resistance committed to holding off the world's military forces while searching for an antivirus. With enemies coming at them from everywhere, can the resistance stop the war before humanity becomes extinct?